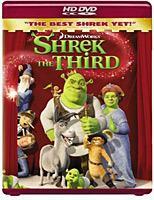 Final specs are in for the highly-anticipated HD DVD debut of 'Shrek the Third,' including word of a first-ever branching PIP commentary and the most comprehensive web-enabled content yet. Although DreamWorks Animation already announced most of the specs for the 'Shrek the Third' HD DVD earlier this month, now they've issued an even more comprehensive rundown of the disc's contents. Expanding upon the picture-in-picture video commentary feature found on other HD DVDs, the "Animator's Reel" will not only present an entire alternate version of the film in storyboard form, but it will further utilize the format's HDi technology to offer a "contextual seamless branch" to lost scenes and other content. 'Shrek the Third' is also set to push the boundaries in terms of what's been offered as web-enabled content on previous HD DVD releases. DreamWorks says a number of additional exclusive features will be made available for download the day the disc hits stores, including a full-length subtitle trivia track, a movie guide with files on characters and talent in the film, plus an interactive coloring book feature that allows you to digitally paint your favorite scenes. As previously announced, the disc will also provide users the ability to customize their own menus based on famous 'Shrek' characters. Once customized, the user's menu will become the default menu for the disc, even after it has been ejected from the player. Additional features identical to the standard DVD edition of the film are set to include audio commentary, multiple making-of featurettes, deleted scenes sand more. DreamWorks has set a $39.98 MSRP for the HD DVD is . As always, you'll find complete disc details for 'Shrek the Third' linked from our HD DVD Release Schedule, where it is indexed under November 13. We've also set up a dedicated thread for the big green ogre's next-gen debut in our Forums area -- click the following link to discuss the 'Shrek the Third' HD DVD release.